Have you recently adopted a puppy? Does your adult dog struggle with negative behaviors such as barking at strangers or pulling on the leash? Or, maybe you have a generally well-behaved dog who could use a little tune-up in the training department? If this sounds familiar, VitusVet has you covered. As the sixth-annual National Train Your Dog Month, January is the perfect time to jump start your puppy’s training and socialization or help your older dog bone up on their manners. Our pets will encounter many different types of people, animals, smells, and other experiences throughout their lives. Socialization is the process of helping your pet learn to navigate the tapestry of life in human society with confidence and comfort. Properly socialized dogs are not as susceptible to stress, making them generally happier and healthier overall. The ideal age at which socialization should take place for a dog is between 8 and 14 weeks of age. Start by introducing your pup to people, animals, and situations he or she is likely to encounter regularly, being careful to end the session once your dog appears scared or overwhelmed, and follow up with lots of praise. “Puppy Kindergarten” classes are a wonderful way to add to your pup’s socialization experience; contact your veterinarian’s office to find out about available classes in your area. It’s a rare person who appreciates being jumped on by a 95-pound Labrador upon entering a friend’s home, or having the hamburger snatched out of your hand at a picnic by a guest’s unruly spaniel. Along with socialization, obedience training is essential to a happy, confident, and well-behaved dog. Your puppy should begin a humane, ethical, obedience class around 12 weeks old. A typical class will teach your puppy how to understand and respond to basic commands such as “sit”, “stay”, “down”, and “leave it” along with loose leash walking techniques. Your puppy will learn to look to you for guidance, and you will learn how to get and keep his or her attention. 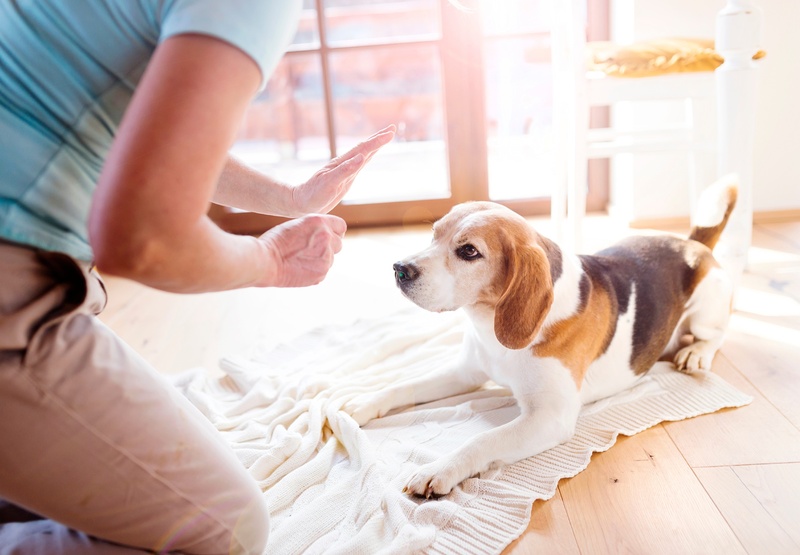 Any pet owner who has tried, unsuccessfully, to work through their dog’s negative behaviors on their own knows the high levels of frustration that can result. This is where professional obedience training can be of help. When working with an adult dog in an obedience class it helps to realize that you are also being “trained” on the proper ways to work with your dog and integrate the behaviors you want to see through practice and positive reinforcement. Don’t let National Train Your Dog Month pass you by! Sign your best pal up for a class today and get ready to enjoy a fun spring and summer with your happy, well-behaved dog.